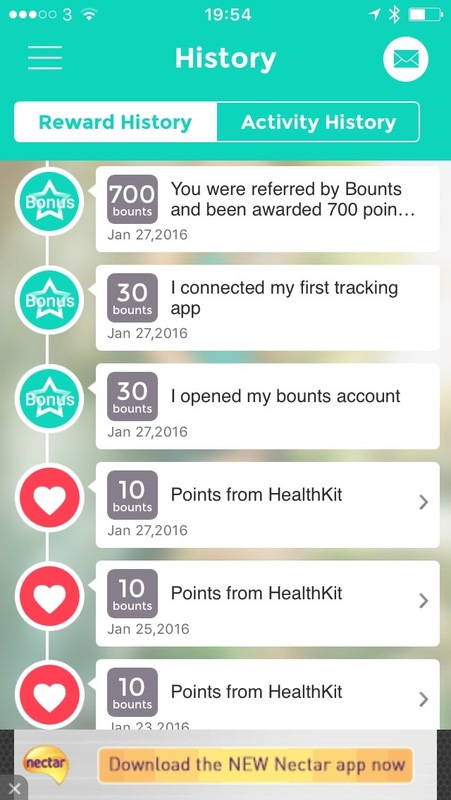 Bounts is the first app to offer you cash rewards for walking, cycling and training in general. Unlike Bitwalking which even after a year after it’s announcement is still invite only, Bounts is available to the public and for walking you earn money. How does Bounts monitor my exercise? 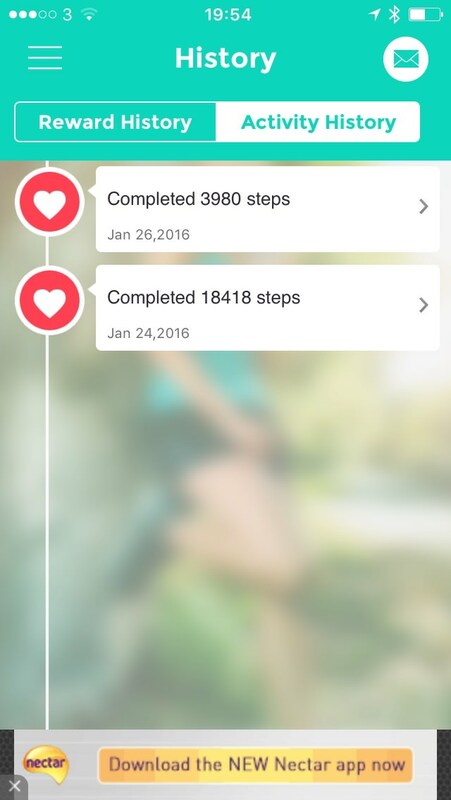 Uou don’t need to have a fancy fitness tracking device it can all be done from your iPhone. Bounts tracks you in a number of ways. Bounts connects to activity tracking apps to record your activities – many are supported including Fitbit, Jawbone, Garmin, Misfit. 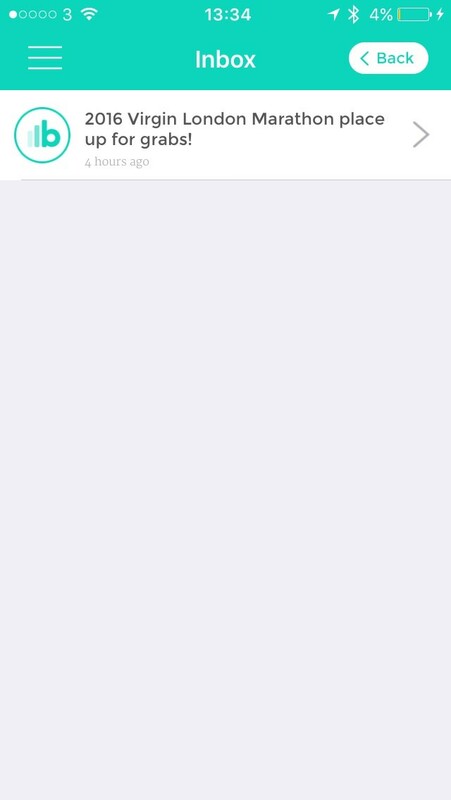 You will then need to sync your fitness tracker to its app on the same device as Bounts for it to register. Via a smartphone fitness app. If you don’t have a fitness tracker, just get free apps on your smartphone such as RunKeeper, MapMyFitness, Moves, and Apple’s default iPhone Health app. Via the Bounts app itself. For checking into the gym or sports centres, based on GPS technology or Bluetooth. There are three types of activity that Bounts will reward you on – steps, tracked exercise, and checking in at the gym – and each of these can get you five points (known as bounts) per day limited to 15 in total for those using the free version. or the equivalent of walking 5km or running 9km will get you 5 bounts points. According to the NHS, the average person takes between 3,000 and 4,000 steps in a day. A target for a healthy heart should be 10,000 a day. To get your next five points, you’ll need to do 20 minutes of continuous exercise in a day. This can include walking at a brisk pace (an average of 4km/h so don’t pause to take in the scenery too much), running, cycling or swimming, depending on which tracker you use. Of course, walking has the advantage that you’re also getting steps. The final five points you can earn in a day come from using the app to check in at gyms and sports centres for at least 30 minutes – so no walking in and straight back out to the fast-food place next door – though we’ve heard some people report just walking past counts. So, how many points do I need for rewards & how long is it going to take? Let’s say you took 7,000 steps and did 20 minutes of exercise every day, and went to the gym three times a week, you’d earn 85 points a week. Note this isn’t a 5 days a week this is a full 7 days a week regime. £1 = 769 bounts earned at 85 bounts per week it would take you 2 months 1 week. £5 = 1389 bounts earned at 85 bounts per week it would take you 4 months. When the bounts have mounted up you’ll be able to spend them at major retailers who have varying rewards. £5 voucher for Tesco, Argos, Halfords, Morrisons, New Look, Sports Direct, Tesco or WHSmith the equivilant of 1,389 points / 4 months excerise, 7 days a week on the free tier. £10 voucher for Amazon, John Lewis, M&S, Boots, Costa Coffee, Curry’s PC World, Debenhams, Pizza Hut, Primark, River Island, Sainsbury’s or Toys R Us – 2,778 points. This would take less than six months, with the bonus points. It is possible you’ll achieve the points necessary to get a £5 or £10 voucher quicker – Bounts gives extra points for joining monthly challenges, for promoting it on social media and when playing its ‘Rewards Wheel’ within the app. You can take a chance on a lucky dip, like the chance to enter the London Marathon although not sure how they managed to secure an entry after the ballot had closed with terms and conditions stating that entries cannot be transferred under any circumstance . 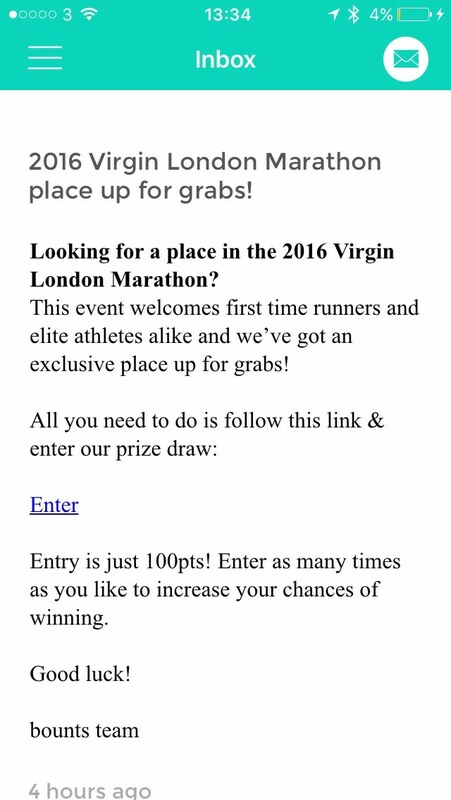 A prize draw entry into the Virgin London Marathon = 100 points. This is where things get slightly more complicated. You can sign up to Bounts for a premium which will get you extra points but remember you need to earn even more points than before to recoup your investment. A lot of people are going to be interested in purely the walking aspect of this app. So if I just walk 7k steps a day how much do I get? So cost of subscription less the max points you can earn a year JUST by walking leaves you with a profit of 640 Bounts points. investment points minus max possible walking points per year leaves you with 3112 points. overall if you are just going to be walking the bare minimum then it’s really not worth pushing for the subscription model. However if you are a do work out on a consistent basis then it might just be worth the return on investment. Playing the Bounts Rewards Wheel. There was a common(ish) pattern here looking at the spreadsheet I used for this. There was 6 unlucky spins on average before winning either another free spin or a reward. Of course like most apps you can allow for notifications. On the morning of the review I work up to a message to say 2016 Virgin London Marathon places up for grabs. Wow, that’s fantastic I can use my points to get a place for the VLM. Sadly it’s not quite that easy. Granted this is all marketing talk yet the message could be a bit clearer to set expectations for something like this. I can’t say i’ll be using up those points for a shot to win this. Let’s hope that bounts can show some good PR photographs when the event happens this year. What about entry to some of the other great 10k events or the Great North Run as well? This could be potentially a very grey area as you are technically taking a gamble. In the UK being tracked via mobile phone is not a new thing Car insurance providers will no let you download an app which tracks how you drive and gives you cheaper insurance. If you use Google, or many other services, you are providing information on yourself for the sake of a discount. 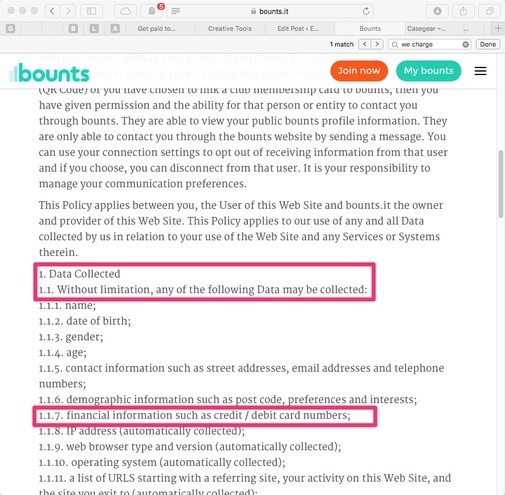 Bounts is no exception so, as with any such service, it is worth reviewing the Privacy Statement carefully. 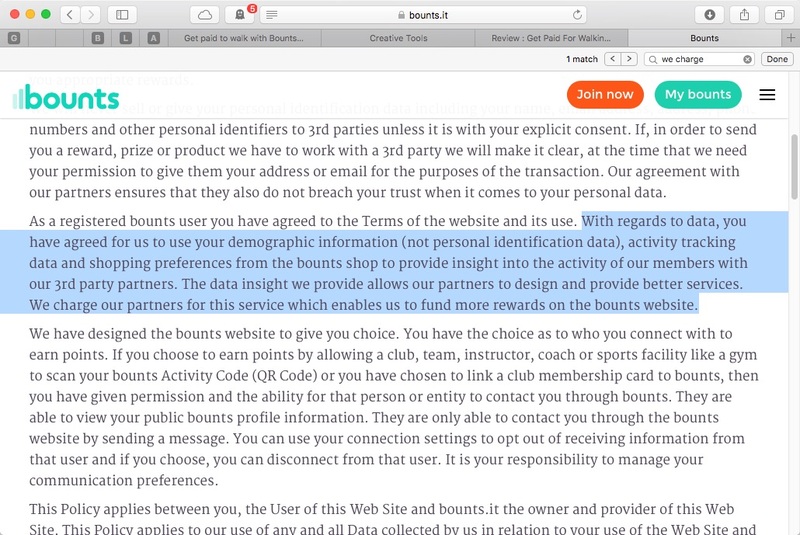 With regards to data, you have agreed for us to use your demographic information (not personal identification data), activity tracking data and shopping preferences from the bounts shop to provide insight into the activity of our members with our 3rd party partners. The data insight we provide allows our partners to design and provide better services. We charge our partners for this service which enables us to fund more rewards on the bounts website. Laying within the privacy statement is also a worrying declaration about storing and keeping your credit and debit card information. I’m guessing this happens when you purchase an account with them. I’ve reached out to them for clarification and will update the site accordingly. Bounts is a free app available from the App store. If you keep things in synch, don’t mind the privacy and tracking aspect then it’s certainly worth a try. That is until Bitwalking comes along… if it ever does. We have heard back from the people at Bounts.it and we wish to make it clear that we have implied nor inferred that Bounts sells your credit card information. They have made it clear in their privacy statement they charge partners for information but do not sell information. I can’t exactly explain what the difference is but I’ve highlighted the statement in question. Will keep this story updated. Of course Bounts.IT have the right to reply. Bounts.it have replied to this point on Twitter. For clarity sake here’s the point in their very own privacy statement I was referring to on twitter. Updated 29th January. 12:46pm Bounts.it are now threatening legal action unless this article is removed or updated. Not the best marketing and PR move for a new company. If they had reached out to use nicely with some manners then we would of gladly worked through the issues one by one. When this app first became mainstream it was unusable for many hours due to popular demand. The right to be forgotten. If you uninstall the application the website and services will keep your data for up to 7 years. What countries data protection act are they acting in accordance with? GPS services Will need to be “always on” to get the full functionality from this app. This leads, like all other applications of this nature, to a significant battery drain. Servers buckling under demand. During the launch and high-profile coverage from a big site the service was unusable (see money saving expert). Bounts charges partners for the data it collects and pass your along, such as geolocation data. As they say they DON’T SELL information, they simply CHARGE companies for information. The difference I will leave up to your interpretation.